storage tip // like most bunched vegetables, radishes roots will store longer if you remove and discard the greens. put roots in plastic bag in the coldest part of your refrigerator. keeps for 10-14 days. Cut veggies and place in layers in jar. Add vinegar, oil & sugar. Put a lid on the jar and shake well, making sure all the sugar dissolves. The veggies get soft and flavorful the longer they marinade. Serve with rice or on a lettuce salad. Pull oregano leaves off stems and remove flowers from chives. Put in a pint mason jar and cover with 1/2 cup apple cider vinegar. Let sit in the sun for at least 6 hours. Wash radishes well. Trim roots and stems and slice radishes into thin wedges. 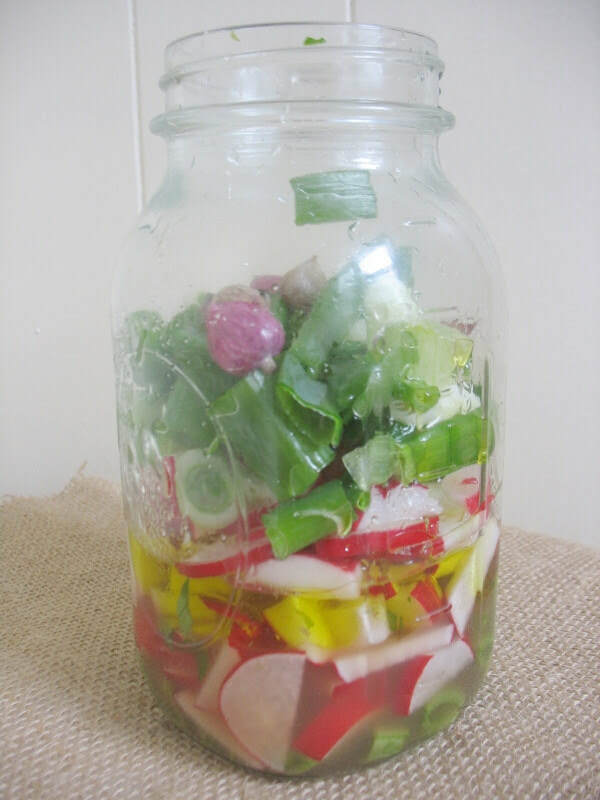 Place chopped radishes into a pint jar. Combine vinegar, water, honey and salt in a small saucepan. Bring to a boil. When brine has reached a boil, pour over radishes. Let jar sit on counter until cool. When cool, place jar in the fridge. Once jar has chilled for 24 hours, pickles are good to eat.